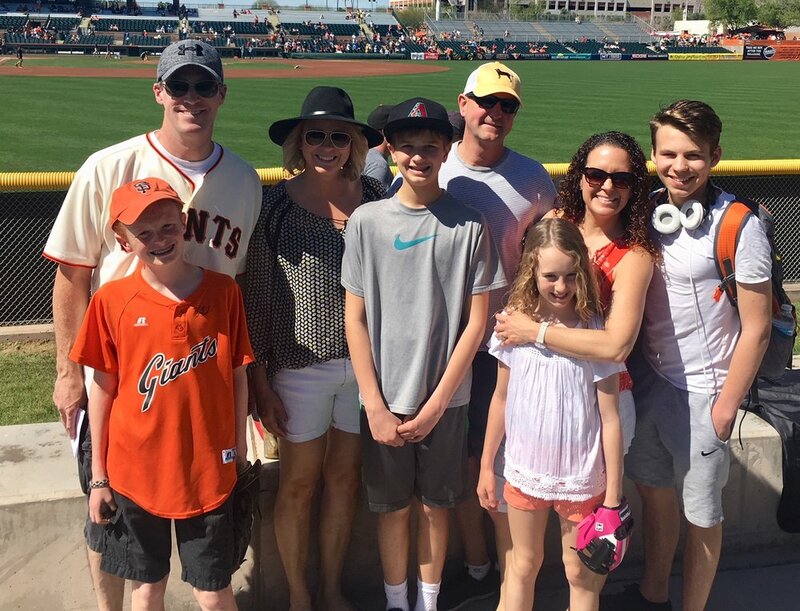 Going to a Spring Training baseball game was on my bucket list long before I married my husband, a devout Giants’ fan. And certainly before I became the mom of a son with the same zealous passion for the sport. People who experienced the trip expressed the same giddiness in their story telling. When asked they went on and on like a kid with their first crush. Their smile said it all. By the time we finally made it to our first Spring Training games in Arizona in 2016 I had no idea why I’d waited so long. I absolutely loved it! Reason 1: It is a true American tradition. There is no other sport in American history with the same level of passion and tradition as baseball. 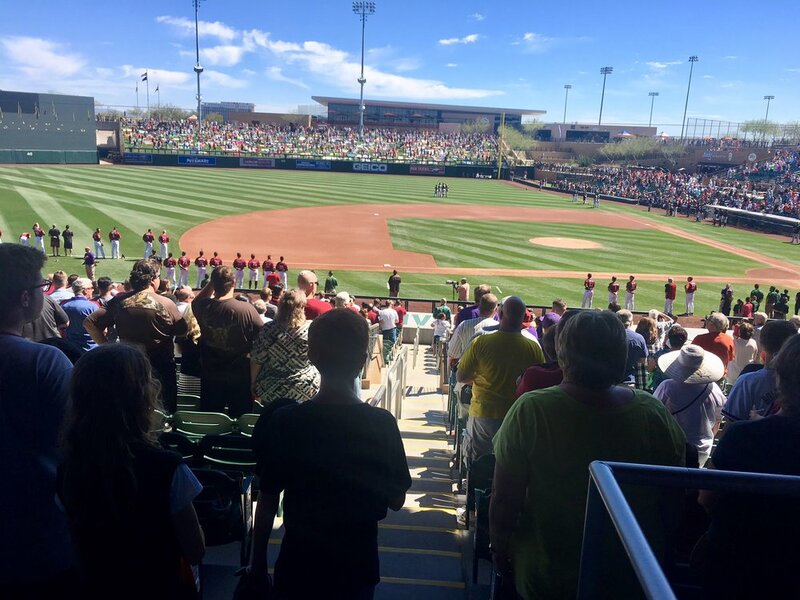 The Spring Training stadiums are smaller than the major league stadiums, making the experience feel in many ways more special. More intimate. More traditional. Flying into Phoenix you feel the first sense of giddiness. Speckled across the desert floor lay dozens and dozens of ball parks. The first time we saw them through the plane windows we started bumping up and down in our seats with excitement. Your second sense of giddiness arrives when you first walk into the stadium. No matter what team you root for, the spirit of the game quickly seeps into your bones. Every sense gets activated. You smell the sweet grass. 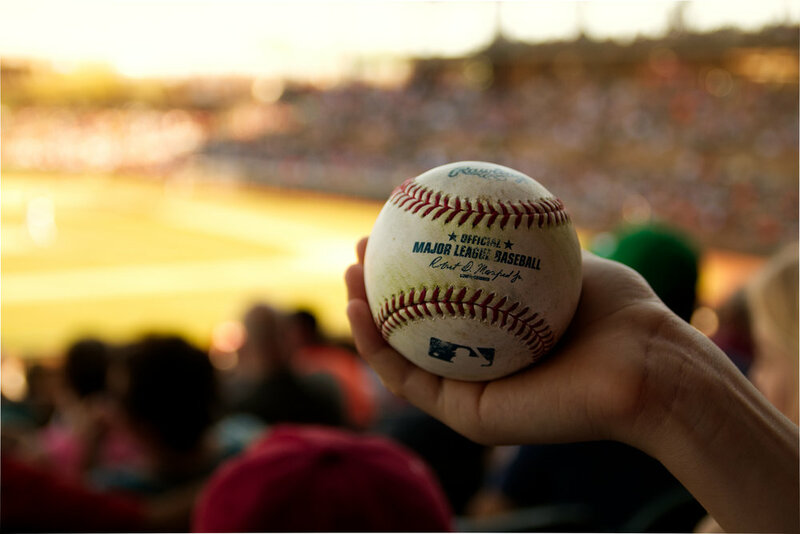 You hear the hotdog vendors yelling “hot dogs, hot dogs, who wants a delicious hot dog?” You hear the crack of the bat and the laughter of the players as they throw pitches to the awestruck fans hoping today is their lucky day. As the national anthem starts, the crowd cheers and the game is on! It just feels good to be there. You cannot help but smile and be proud to be an American. Reason 2: The food fare is limitless. Of course you have the traditional favorites like loaded hot dogs, nachos, popcorn and cotton candy. 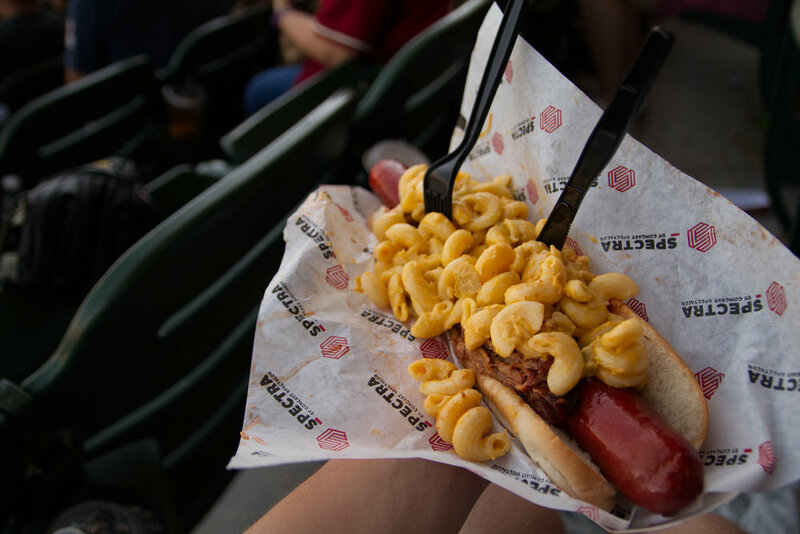 But in the 21st century baseball stadium, your taste buds will also be tempted by gourmet tacos with homemade guacamole, juicy German style dogs loaded with sauerkraut, or unique and tasty pizzas with toppings such as potatoes, sun dried tomatoes and hot peppers. Reason 3: The weather rules. It’s March, so no matter where you live in the US you are likely experiencing some rain and cold. Arizona in March can’t get prettier. The cacti are blossoming in the sun that’s warm, not blistering. The sky is blue and the pools are cool— that alone could tempt you. 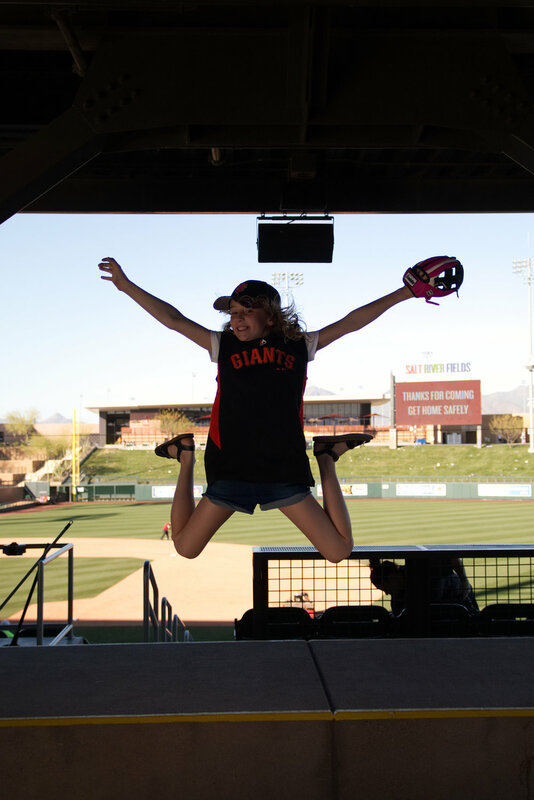 With sunblock and your favorite baseball hat, you can enjoy the warmth on your white legs and shoulders, relishing the “spring” of Spring Training. Reason 4: Camaraderie. For non-baseball fans, 9 innings can feel like 9 days. But baseball lovers know that this slower moving sport has its benefits: namely, quality time. My family and I spaciously move between our full attention on the game and playful conversations about life. Hopefully you find yourself at a game with people you love. Take advantage of that. Grab a beer, settle in, and let the conversations flow. Reason 5: Fans matter. Most importantly, this is your chance to show your favorite team how much you love them. Spring Training is as much about the players getting physically ready as it is about them getting emotionally ready. Here is where the fans come in. Teams whose fans spend March showing them their love go into the official season feeling inspired, energized and on the top of their game. My most distinct memory is my son standing feet from the field with a ball in his hand—patiently waiting to catch the attention of any player who would return the admiration with a signature and a smile. Renée Dineen is an executive and life coach, business consultant, leadership development expert, workshop leader and writer who has been transforming organizations, teams and the careers of talented and ambitious professionals, entrepreneurs, changemakers and executives for over 20 years. Renée lives with her husband and two children in Sacramento, California. She and her family are fueled by their passion for travel, which includes 45+ countries and counting. Inspired by these experiences, Renée is writing a book she hopes will expand some of the limiting paradigms that keep parents from traveling with children. Her blog on the topic can be found at travelmomentswithkids.com.